The late Iranian Emperor's expansive reform-programme launched in 1963 was named as the "White Revolution" due to it being a blood-less and progressive transformation. "Shahbanou" is a persian term for "Empress" (Shah = Emperor / Banou = Lady). 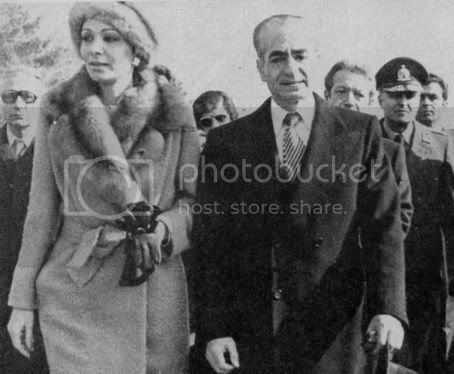 This is the title bestowed upon the current Iranian Empress (in exile) Farah Pahlavi (right in picture). Iranians under Arabo-Muslim occupation are referring to the President of the occupational Islamic Republic's (AhmadiNejad) wife as "Anbanou" (left in picture). "An" which is a persian for "excrement" is a term Iranians have bestowed upon and use to refer to the occupational Islamic Republic's President AhmadiNejad. "Anbanou" recently came out of the miserable hole which AhmadiNejad keeps her in and made some comments about providing aid to palestinians, in which the above exclusive photo of this reclusive muslim specie was made. Hopefully in the near future Iranians will cleanse Iranian society of all these an's, antar's, & ahmagh's!!! The anti-Shah camp’s propaganda centres on a few topics which they ardently stick to and repeat to death until some ignorant fool buys into it. I was reading a commentary by an anonymous compatriot (on a certain site which I do not like to advertise on my blog) and would like to share this compatriot’s answers to the repetitive propaganda used by the anti-Shah camp. I have formatted the anonymous user’s replies and added my own commentary to it as well. Anti-Shah propaganda (1): If Shah was so great as many claim here, why there was an uprising (revolution) by millions of Iranians who toppled him from power? Answer: One might expect a short and sweet answer to this question but if one is not aware of the complex circumstances that built up to the Islamo-Leftist takeover one might very well be duped into believing that the revolt was a popular one. First of all, despite there being large crowds, reaching the hundreds of thousands, there are no confirmed statistics of the actual crowds that were demonstrating but the numbers which are used by the Islamic Republic and other symphatizers are based on actual eye-accounts with substantial exaggeration added to these subjective accounts that run in the millions (!). Having said that, there were indeed very large crowds out demonstrating, causing havoc, destruction and spilling of innocent blood. Why were they demonstrating? Well for the Islamo-Leftist factions in these crowds they were against the late Shah’s democratization efforts and modernization plans that were in effect. The clergy was especially infuriated because they had lost the huge amount of lands which they had owned at the hands of the government which had confiscated these lands in their land redistribution plan. The muslim clergy was also feeling their influence and power over Iranian society slowly eroding due to the progressive agenda of the government and thus were fighting to keep their livelihoods of leeching upon Iranian society’s ignorance. The left in particular disliked the fact that the Shah was harsh on leftist guerrillas and factions whose allegiance were to the Soviet Union and the fact that he was such a close ally to the U.S. These two potent forces had thus joined in what the late Shah of Iran called an un-holy alliance of Red (Leftists) and Black (Islamists), hellbent on destroying the Shah and his progressive vision of a prosperous, democratic, and modern Iran. 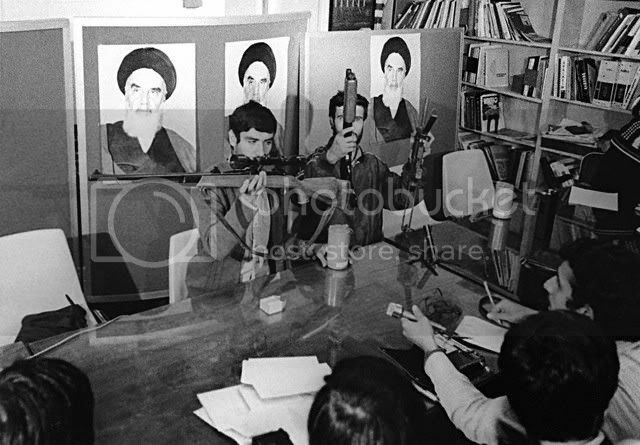 To this end they had embarked on a massive propaganda campaign to spread lies and exaggerations about the late Shah and the Iranian Government. As an example, according to Akbar Ganji and Emadin Baghi (themselves revolutionaries and intelligence officers of IRI), revolutionaries exaggerated corruption of the Shah’s Government (from murders to embezzlements and everything in-between) by factors of between 100 and 1500 to justify their take-over of the country. They also lied about the future, in the form of promises they made to the masses, from free bus service to free electricity and delivery of 350 tomans (Iranian currency) to everyone’s house every morning. In effect those who bought into these lies and exaggerations had ambitious expectations of heaven upon earth by supporting the armed insurrection and demonstrations against the Shah’s government – this despite their living standards being one of the best in the region, having risen from that of being a dirt poor, disease-ridden, lawless country to one of the world’s fastest growing economies. Ungratefulness and greed is what marked the participation of many politically non-affiliated demonstrators. Another variable in this regard, was also the unfamiliarity of people with any other system of government, even the democracies of the west. Once the exaggerations were taken out, corruption in the Shah’s government was only slightly more than that in western democracies, and by the standards of neighbouring countries would make the Iranian government look exceptionally well! 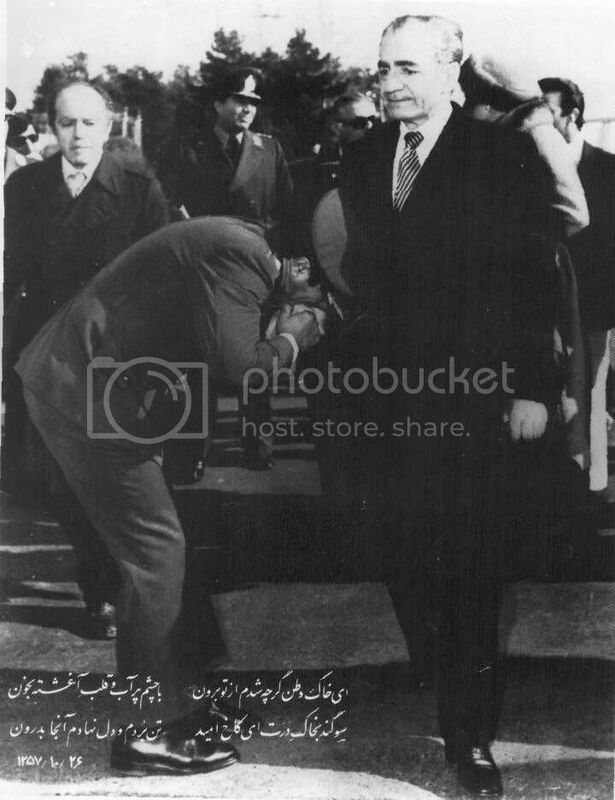 This was also an issue that had been acknowledged (corruption) by the Shah and which was continuously being addressed, taking into mind that Iran was still a developing country, which albeit having taking huge steps from the state it was before the Pahlavi Dynasty, still needed more time to reach the standards expected by people in the west. People knew none of this; that no government is perfect. Another major factor in people joining the Islamo-Leftist Revolt was the religiosity of people: they were more comfortable with likes of Ayatollah Khomeini than the late Shah of Iran. Iran had for 1400 years been partly under the yoke of Arabo-Muslim Occupation and later under the influence and control of the Muslim clergy which exercised supreme power over the population for centuries; thus Iranian society at the turn of the 20th century was not only poverty/disease/-stricken and illiterate but they were also highly superstitious due to the influence of the mullah’s/ayatollah’s in the muslim clergy. Again, great strides had been taken by the Pahlavi Dynasty to modernize and educate the country. Illiteracy levels which were in the region of 99% at the turn of the century had experienced an impressive improvement by the 1970’s. However, even with a population that can read and write this did not present a definite cure to centuries-old ingrained/indoctrinated superstition. Thus their problem (the people who had joined the demonstrations) was not that the Shah was not good enough, their problem was that the Shah mandated their daughters to go to school without hejab (Islamic female headcovering), music to be played on radio, foreign films shown on TV, alcohol served in restaurants/cafe’s, females attending universities and mingling with men freely etc… which were all “haraam” (Islamic term meaning “forbidden”) in their views; otherwise the corruption of the Shah’s government had nothing to do with 99% of the population which went about their own business day in day out. Tying in with what I laid out earlier, they had also forgotten where they came from. When Reza Shah the Great took over the country, Iran had 3% literacy, when the Shah left the most pessimistic views show that Iran had 65%+ literacy rate. That is +60% change in 54 years. Secondly, per capita income increased from about $150 to $2400 (without adjustment for inflation). Schools opened, engineers and doctors replaced the superstitious appeal of going to the shrine of some dead muslim killer/thief/opportunist that had been glorified to sainthood by the muslim clergy. Working for companies replaced opium trade in the bazaar (traditional marketplace). All of this and more was just too much for people to digest and to accept in such a short time span, and others became greedy and arrogant, attributing all successes and advancements to themselves and not the policies of the catalyst that was the late Shah of Iran. Having outlined the affinity with backwardedness and superstitiousness, the majority of people who participated in the revolt thus made a better connection to a regressive and backward muslim clergyman like Ayatollah Khomeini, than with a patriotic/progressive/modern individual like the Shah of Iran and the new progressive clean-cut class of tehnocrats around him. 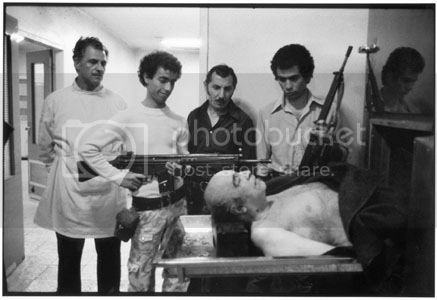 Anti-Shah propaganda (2): If he was a patriot working for people, why he had to resort to violence, imprisonment and torture of dissidents, SAVAK, Evin, etc.? Answer: In hindsight, one of the late Shah’s flaws might have been his unwillingness to introduce political reform in a faster pace. His main worry was that an uneducated populace would easily be taken advantage by the country’s enemies, in particular the communists, which would use the opportunity to grasp power through the peoples’ political naivety. Literature which was not deemed “appropriate” was thus censored or banned, fueling anger by both the leftist and islamist camps. 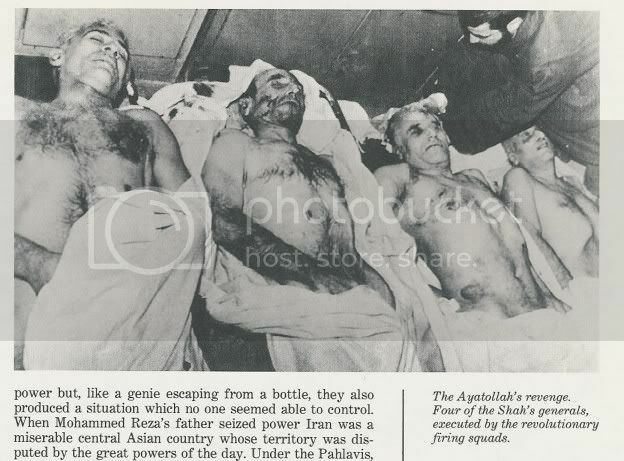 Although the reasons for this censorship might have been understandable, I do not think it was the right thing to do as it gave more material to the anti-Shah camps to use in their propaganda campaign and incite more hatred. In terms of SAVAK (the national security agency of Iran), there is no government in the world that tolerates violence against its sovereignty. 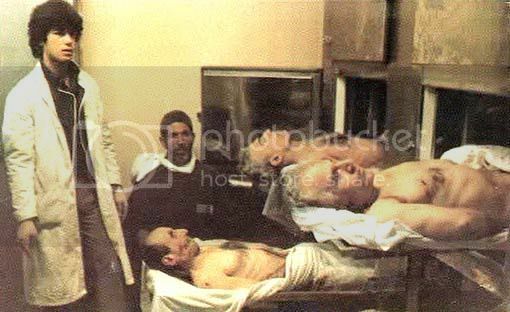 The overwhelming majority of people who had been arrested by SAVAK were criminals and terrorists such as Ayatollah Ali Khamenei, Ayatollah Hashemi-Rafsanjani, Masoud Rajavi etc. In any society, there is some 1% that belong to prisons for the sake of the rest, and political prisoners (majority being characters as listed above) were somewhere around 3 thousand at the time before the Islamo-Leftist Revolt (figures published by Islamic Republic officials); that is 0.01% of the population and not 100’s of thousands as was claimed by the Islamo-Leftist mob; it was these very same prisoners who upon their release brought us 30 years of disaster, death, murder and thievery. Anti-Shah propaganda (3): If Iran was independent, free and strong, why the foreign powers used to dictate everything to him? Answer: I do not know what independence means in this day and age. Countries are not isolated entities anymore and international relations are based on give and take where powerful countries use not-so-powerful for their interests. PM Mosaddegh tried to borrow $300M for the daily operation of his government and failed to secure a loan from America. He needed America to survive and if he was not willing to reciprocate an American favour there was no chance of a mutually beneficial relationship. So people who try to use strong political relationships between two sovereign nations such as the USA and Iran, at that time, in branding the late Shah as a puppet being dictated by the Americans are just politically naive, irrational and emotional people. Yes, he gave points to westerners (such as selling oil to America during the Arab oil embargo) and received points from the west (such as admitting 50,000 students to American universities in a massive education campaign, gaining access to sophisticated military weaponry etc). A wise leader should be willing to cooperate/negotiate with other sovereign nations in making the best of a socio-economica-political situation to help his country progress. An ignorant, foolish, and irrational leader lives on slogans of independence and allows his people suffer and remain in the past (not too different to PM Mossadegh’s radical oil nationalization drive which threw the country into an economic collapse due to the expertise of operating such a complex industry did not exist in Iran at that time!). To conclude this then, by working with major powers of that time the late Shah was able to transform a backward country with a bleak future into a progressive, modernizing, prosperous country with a bright future in store for future generations. It should be remembered that the main reason the Islamo-Leftist Takeover was able to take place in Iran (1979) was because a small loud group of radicals with backing by powerful foreign nations was able to dupe Iranians and terrorize/shut up the silent majority who were too terrified to stand up against their massacres and threats. Tomorrow will mark the 30th year on the day which the late Emperor of Iran, Shahanshah Aryamehr, left Iran in an effort to calm the tensions and violence which was being fueled by foreign powers in Iran through the leftist and islamist forces within the country. In a desperate attempt to find a peaceful solution, the Iranian Emperor left Iran to avoid any further bloodshed of his countrymen and further destruction of the country's national instutions and infrastructure at the hands of the islamist and leftist militias. As the Iranian Emperor left his beloved motherland with tears in his eyes, thousands of Islamist and Leftist supporters rejoiced in the leaving of His Imperial Majesty and many previously non-affiliated/apolitical Iranians who had been brainwashed by the consistent anti-Shah campaign also celebrated the Monarch leaving the country which he had wholeheartedly dedicated his life in service to, and which thanks to the efforts of the two Pahlavi Emperor's had become a regional, independent, progressive, modernised, prosperous, and powerful state from that of being a backward, illiterate, poverty and disease-stricken, lawless land abused by foreign powers at the turn of the century. Emotion grips His Imperial Majesty, the Shahanshah of Iran, as he leaves the country he dearly loved and served for 37 years. A member of the Imperial Iranian Armed Forces pays his last respects and reaffirms his loyalty to the leader of his country. A member of the Imperial Iranian Armed Forces tries to prevent His Imperial Majesty from leaving. Shortly after His Imperial Majesty left Iran, France was quick to charter a plane for Ayatollah Khomeini, the fundamentalist muslim religious leader which the west had groomed to oversee Iran's social, political, and economical destruction. On February 1, 1979, the Ayatollah arrived on a chartered Air France flight. Before landing Ayatollah Khomeini was asked by a foreign reporter what his feelings were upon returning to Iran after many years of exile - his answer was a cold and resounding "nothing"; which his translator/supporter (who apparently is somewhat more intelligent than the braindead muslim ayatollah) quickly re-interprets for the foreign journalist as: "he doesn't want to make any comments". 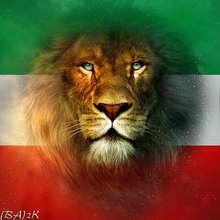 Furthermore at a meeting of the High Command of the Iranian Imperial Armed Forces, a treasonous declaration was agreed upon and issued (although not by all present) to declare neutrality in this conflict which threatened the Iranian nation's integrity and safety of its populace! In effect a large number of General's commited treason against the country they had sworn to serve and protect. 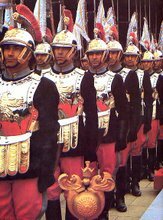 By declaring their neutrality the Imperial Armed Forces, apart from loyal forces in the various military branches that stayed loyal to their King and Country till the very last breath of their lives, also allowed the Islamist and Leftist forces to kill and destroy as they pleased and eventually allowed the country to come under an anti-Iranian 2nd Islamic occupation. Thousands of Iranians welcomed Ayatollah Khomeini, this anti-Iranian muslim preacher, as a "savior" whilst the majority of the Iranian nation, shocked at the events that were taking place, remained silent in their homes, too afraid to speak their minds amidst the violence and lawlessness, cautiously awaiting how the situation would develop. Islamist and Leftist terrorist groups holding guerilla warfare & arms-instruction classes, and distributing weapons amongst their supporters in their efforts to destabalize the Iranian government and fueling more violence that will further fuel their propaganda efforts against the state. 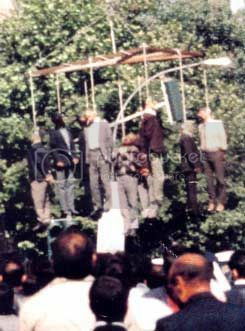 Mass executions of Iranian statesmen, military officials, and opponents to the occupational and illegal Islamic Republic took place on a daily basis in the early years of the Islamic take-over. After 30 years marked by war, socio-economical destruction, political repression and wide-spread executions of Iranian freedom activists, country-wide poverty, rampant prostitution and drug-use, harbouring and supporting islamic terrorist groups across the world with the Iranian nation's wealth - Iranians which were actively or passively part of those historical days today realize and admit to their naiveity, foolishness, cowardice, and anti-patriotic acts.